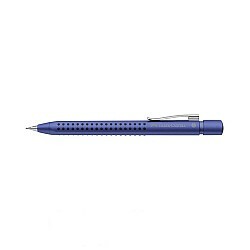 The Faber-Castell Grip 2011 fountain pen has the same ergonomic triangular cross-section as the Faber-Castell Grip 2001, while the non-slip grip .. The Faber-Castell Grip 2011 mechanical pencil has the same ergonomic triangular cross-section as the Faber-Castell Grip 2001, while the non-slip grip .. The Faber-Castell Grip 2011 fountain pen has the same ergonomic triangular cross-section as the Faber-Castell Grip 2001, while the non-slip grip zone helps provide a comfortable and relaxing hold for all of your writing sessions. The fountain pen has a stainless teel nib and uses a cartridge/converter filling mechanism. The Graf von Faber Castell ink is perfectly for smooth writing. The ink is available in attractive small boxes which contains 6 ink cartridges full wi.. The Faber-Castell fountain pen ink is produced in Germany and comes in a glass ink bottles of 62,5ml in blue and black. Faber-Castell aims to provi..